It’s a freeze dance, ﬂash card style. Dance around the room until the music stops...freeze and respond to a ﬂash card…then dance again! Freeze It contains grade-appropriate content categories. Content is presented in the style of flash cards, which appear when the music freezes. 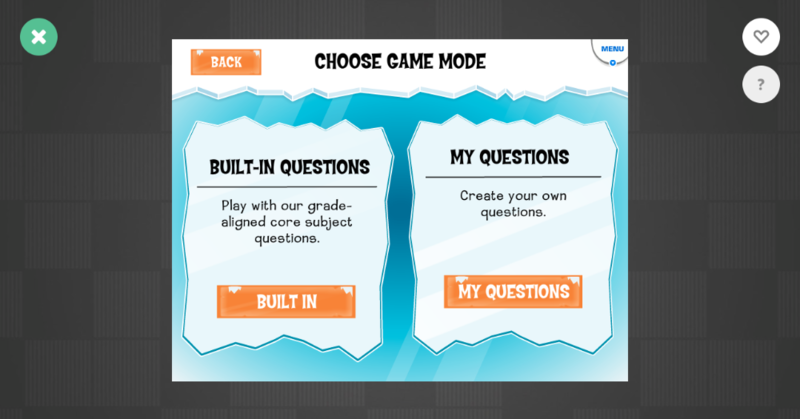 Choose from math, reading, geography, emotions, letters, colors, or your own custom content! 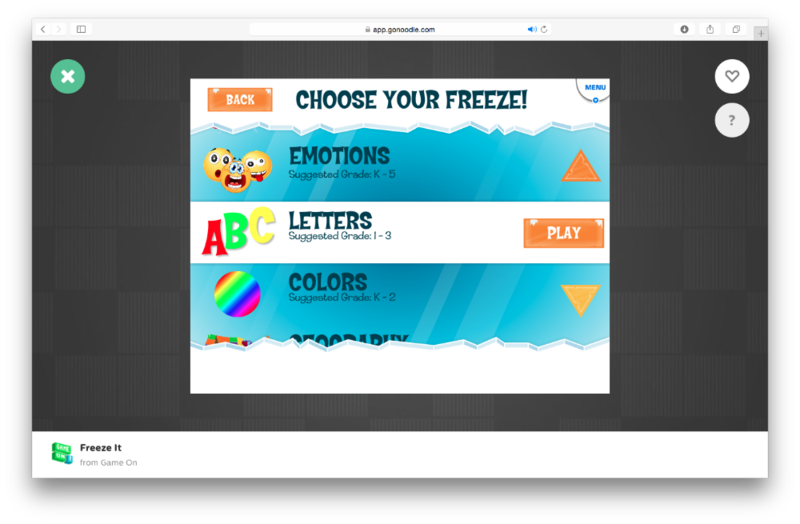 Note: Freeze It is a GoNoodle Plus game and is only available if you have access to GoNoodle Plus! Learn more about GoNoodle Plus. Using Custom Questions in Freeze It! At the start or ﬁnish of a relevant lesson. Note: Freeze It does not work on mobile devices or tablets at this time. This activity can only be played when using a desktop or laptop computer. Reviewing core-aligned concepts through fun physical activity helps make content memorable. Students dance when they hear music. When the music stops, a question appears on the screen. Have students answer or react, then click Continue to start dancing again. Once one minute has passed, review the questions and prompts that appeared in that session. Then play more, select a new freeze, or get back to classwork! Freeze It contains grade-appropriate content categories. Content is presented in the style of flash cards, which appear when the music freezes. Note that not every category is available for every grade. Emotions (Grades K - 5): Students act out emotions that appear on the screen. This category helps students learn about expressing specific emotions and expands relevant vocabulary. The content presented is grade-appropriate. Colors (Grades K-2): Students identify colors and patterns and are asked to find an example of that color in their classroom. This category helps students expand the color vocabulary and connect those words to real-world examples. Letters (Grades 1 - 2): Students are presented a letter of the alphabet and prompted to call out a word that starts with that letter. This category helps students explore the alphabet and practice identifying initial sounds. Reading (Grades 1 - 5): Students are presented a grade-appropriate reading word and are asked to read the word aloud. This category helps students develop automaticity with sight words (in lower grades) and practice decoding skills (in upper grades). Time (Grades 1 - 2): Students are presented an analog clock and are asked to provide the time aloud. Addition (Grades 1 - 2): Students are presented a grade-appropriate addition problem and are prompted to answer aloud. This category helps students develop automaticity in math facts. Subtraction (Grades 1 - 2): Students are presented a grade-appropriate subtraction problem and are prompted to answer aloud. This category helps students develop automaticity in math facts. Multiplication (Grades 3 - 5): Students are presented a grade-appropriate multiplication problem and are prompted to answer aloud. This category helps students develop automaticity in math facts. Division (Grades 3 - 5): Students are presented a grade-appropriate addition division and are prompted to answer aloud. This category helps students develop automaticity in math facts. Mixed Numbers (Grades 4-5): Students are presented an improper fraction and are prompted to convert it to a mixed number. This category helps students develop automaticity in math facts. Improper Fractions (Grades 4 - 5): Students are presented a mixed number and are prompted to convert it to an improper fraction. This category helps students develop automaticity in math facts. Go, Slow, Whoa Foods (Grades K - 5): Students are presented various food items and are prompted to categorize foods as “Go,” “Slow,” or “Whoa” foods. This category helps students explore and evaluate the nutritional value of different foods. The content strategy in Freeze It was developed with input by Common Core experts to ensure grade-appropriateness and benefit for the classroom. You can customize Freeze It with your own custom question sets. Playing with custom content opens up the game to infinite options. Go Foods: These are foods that are good to eat almost anytime. These are the healthiest foods. Slow Foods: These are sometimes foods. They aren’t off-limits, but they shouldn’t be eaten every day. At most, eat them several times a week. Whoa Foods: These foods should make you say exactly that: "Whoa! Should I eat that?" Whoa foods are the least healthy; you should only eat them once-in-a-while. Introduce the concept of Go, Slow, and Whoa foods. Use the downloadable Go Slow Whoa Food Chart from the NHLBI to introduce the categories in details, along with examples. Play Freeze It and select the Go, Slow, Whoa Foods category. Use the answer key below to provide feedback if you’re unsure of how to categorize a food. At the end of the play session, review each of the foods presented in that session and their appropriate categorization. Discuss why each food might fit in that category. Find a standalone version of the answer key with justification for the answers here.